A plant of Hydnora and the two Euphorbia plants to which it is attached have been excavated and washed. This Hydnora plant is the only one ever known to have been cultivated. The seeds were collected in the Karroo Garden, Robertson, South Africa, by Sherwin Carlquist in 1973, and brought back in a fresh condition to his home in Claremont, California. 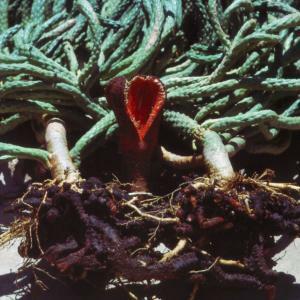 He purchased several rooted cuttings of Euphorbia caput-medusae, a known host plant for Hydnora africana, removed the Euphorbia plants from their pots, lined the pots with Hydnora seeds, and put the Euphorbia plants back into their pots. During the next several years, the Euphorbia plants were repotted, but noting appeared to have occurred. The Euphorbia plants were planted into the ground. In 1979, a flower of Hydnora appeared. Apparently the development of a seedling of Hydnora is slow. Also, the development of the Hydnora may have accelerated when the plants of Euphorbia were planted into the ground and thereby enlarged in size beyond the size they had when potted. In this photograph, portions of two of the Euphorbia caput-medusae plants are shown. The roots of the Euphorbia are white, and thereby they are easily distinguished from those of the Hydnora, which are dark brown. The plant of Hydnora consists of thick succulent roots. Hydnora has no stems. The flowers of Hydnora are borne on the surfaces of the roots.